The first row of icons in the Tools panel (below the larger 3 icons) contains the drawing tools: the brush, the rectangle, the oval/circle and the fill tools. The second row contains several tools for working with selections. 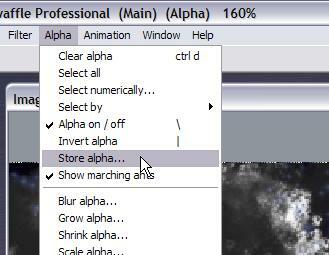 They're called the Alpha tools because the selection is stored in what's called the alpha channel. The left-most alpha tool is the Lasso tool. You can use it plain and by itself, or with the SHift key as a modifier. If you use Shift with left mouse button to lasso, the new region in the lasso is added to the current selection. If you use shift with the right button it lets you subtract a selection from the current selection, to make holes for example. 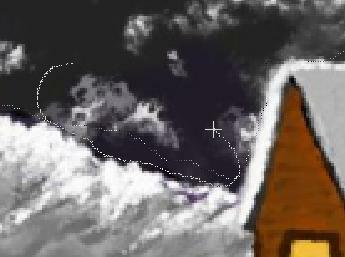 Using the Lasso tool, 'draw' the desired selection as a region around the top sky area. You can start the selection 'outside' of the actual image if you either zoom out or resized the window to reveal the grey area around it. 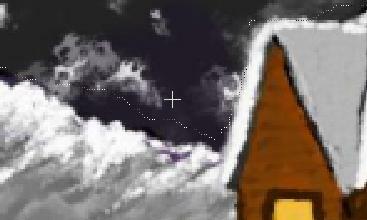 Note that the first selection pass is a large and not very precise region. No worries, we can fine tune it if necessary. 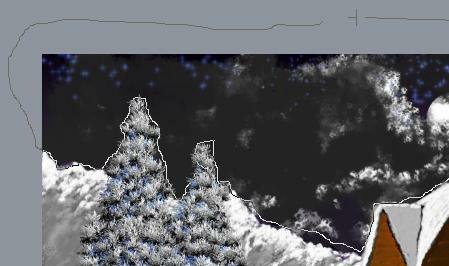 For example, in the area shown below, the selection (marching ants line) is way above the intended separation from white mountains and dark skies. 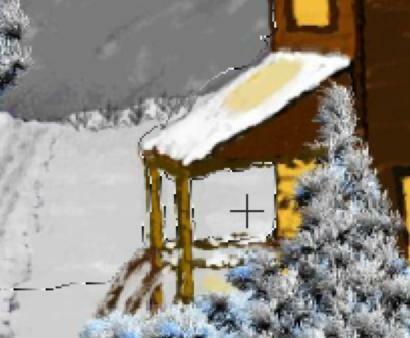 You can draw another selection to capture the missing pieces, making sure that you use the SHIFT key while drawing the region with the left mouse button. This will 'add' the new region to the current selection. You can use the zoom tool in the tool panel (4th row of tools in the Tools panel - nested boxes). Or you can use SHIFT-Control and left or right mouse drag topan and zoom without moving away from the work. 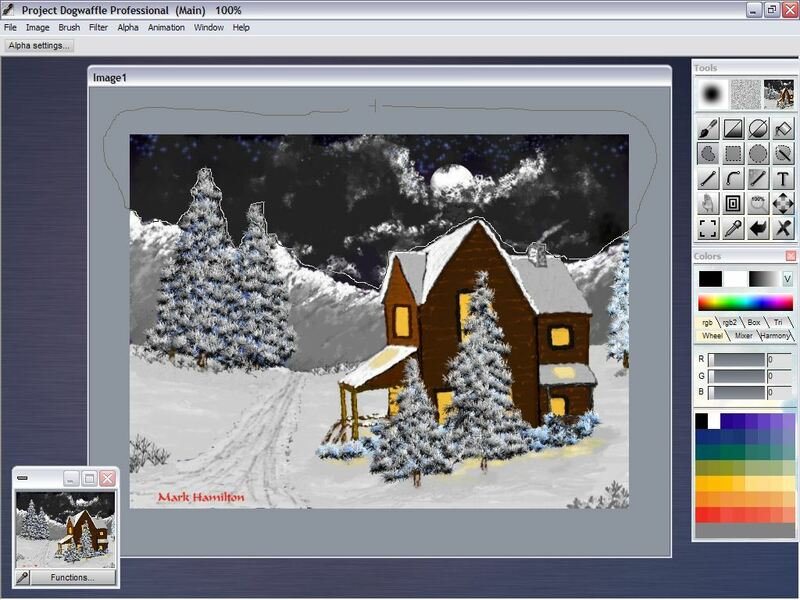 This is faster and avoids the travel to and from the interface: use both hands: left hand on Control-Shift and right hand on the mouse to Pan and Zoom through the image details. Here's a snapshot of the new region being defined. You notice that the prior marching ants are still showing while we're drawing the new outline which we want to add. SHIFT key is pressed down all the time during this. 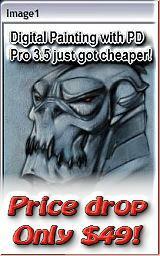 If you accidentally clear the prior selection, use Ctrl-Z or 'u' to undo and return to the good selections. Of course, just like storing the image buffer's RGB channel from menu:Image>Store..., it would be very smart to occasionally store a snapshot of the selection found in the alpha channel. Here's an example of the stored selection. 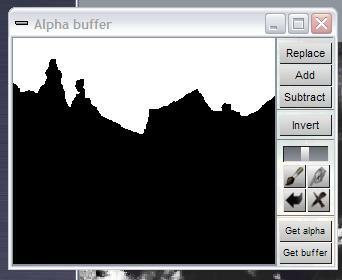 You can invert it, paint on it, smudge it and put it back into the active alpha channel (Replace) or add or subtract it from that. 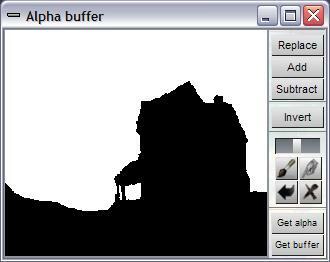 You can also grab (Get) the current alpha to show as stored here, or get the image buffer and convert it straight into this greyscale rendition for future possible use as alpha. This is a very powerful tool. The reason for all this is that we want to have easy access to this and a few other masks. By having them selected in alpha and stored in their own snapshots we can simply click 'Replace' on the one we want at any given time. It's time to add more. 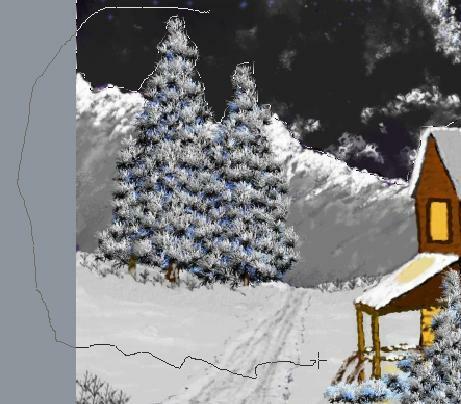 The background (sky region) is still selected, let's add the middleground: hills and trees, but not the house. 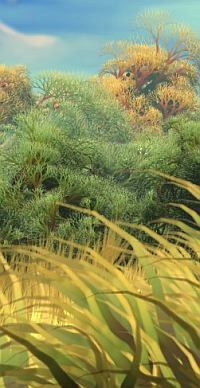 Under theside roof and between the pilars there are some small areas that we should also add to the new selection. Zoom in and define the additional regions to be selected.